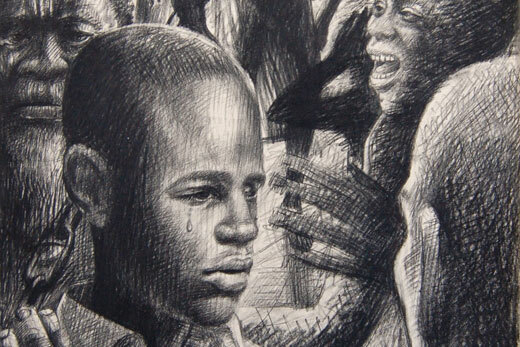 Detail from an illustration by J. Biggers for Lorenz Graham’s 1966 book "I, Momolu." Courtesy of the John Biggers Archive in the Manuscript, Archives and Rare Book Library at Emory University. University teachers and scholars have the opportunity to examine the past, present and future of black aesthetics through a new summer institute at Emory University sponsored by the National Endowment for the Humanities. The cultural significance of African diasporic art in all forms, and how it is presently defined, understood and applied, will be the focus of "Black Aesthetics and African Centered Cultural Expressions: Sacred Systems in the Nexus between Cultural Studies, Religion and Philosophy." The institute will be based on the Emory campus from July 13-August 1, 2014. Applications for the institute are due March 4; participants also will receive a stipend to support travel and accommodations. "We have the components in place to do something truly special and engage deeply in questions about black aesthetics to increase our understanding of the multiple meanings associated with black art, its production, and its ongoing relevance as a medium of liberation," says Pellom McDaniels III, co-director of the NEH Institute, and assistant professor of African American studies at Emory and curator of African American Collections in Emory's Manuscript Archives and Rare Book Library. Through participation in lectures, workshops and public performances led by historians, art historians, musicologists, religious studies scholars and artists, participants will examine the concepts and criteria for black art from the defining era of the Harlem Renaissance, including the works of philosophers and educators Alain Locke and W.E.B. Du Bois, to what black aesthetics mean today. The National Black Arts Festival will be held in Atlanta during the same time as the NEH Institute, which, in addition to the academic and cultural resources at Emory and other institutions in Atlanta, "will help us build bridges across the city among people and artists interested in discussions related to African Diasporic arts practices, and revive interest in this area of scholarship for future research and intellectual inquiry," McDaniels says.